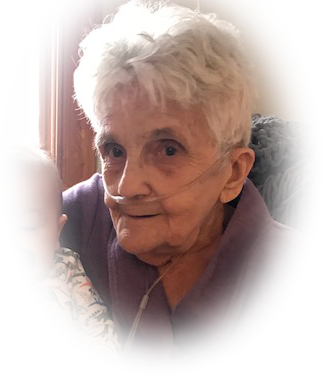 Beverly Denise Komrosky, 88, passed away September 3, 2018 at St. Vincent Hospital in Billings, Montana. Beverly was born March 7, 1930 in Sheldon, North Dakota to Hans and Rose (Meyer) Dahl. June 3, 1959, Beverly married Leroy “Harry” Komrosky and, together, they raised 8 children. During their many years together in Glasgow, Beverly worked at Stockman Bar, Markle’s Hardware, Kilts Café, drove school bus, and was owner of Curley Top Beauty Salon. Some of her greatest stories came from riding shotgun to Harry as a long haul truck driver throughout the U.S.
During their marriage, Beverly enjoyed taking family vacations, dancing with Harry, racing at Duck Creek Raceway, playing bingo, and bowling. For the last two years, Beverly has enjoyed watching her grandson, Dayne, race cars where he carried on Grandpa Harry’s tradition of #88. If Beverly had a choice, every day would be race day with Dayne. Beverly’s biggest joy was her family. Her kids, grandkids, and having the privilege of being “GG”(Great-Grandma). Beverly was the true matriarch of the family. Caring and nurturing was always her priority. The last 15+ years of her life was spent living with her daughter Rae and grandkids in Billings. During this time, she helped Rae care for her kids while she went to Nursing School. These years together have created a strong, unbreakable bond with her grandkids Dayne, Alyssa, and Ashlie. Beverly was proceeded in death by her husband Leroy “Harry” Komrosky; her sons Norris, Norman, and Darrell; her brothers Gary, Roger, and Norm “Bawky”; sisters Mavis, Sharon, Darlene, Delores “Bing”, and Elenor “Sis”. She leaves to cherish her memory three daughters Raelynn (Dale) Harris, Darlene (Jim) Henderson, and Debbie Bryan; two sons Doug (Carol) Komrosky and Ole Komrosky; granddaughters Alyssa (Jake) Pierce, Ashlie Kocher, Paige Komrosky, Lucinda Aguirre, Brandi Komrosky, and Lacy Wood; and grandsons Dayne (Kayla) Kocher, Brandon (Krista) Komrosky, Drew (Stacey) Komrosky, Brandon Harris, Larry (Christine) Bryan, Ron (Debbie) Bryan, Norris Thompson and Ryan (April) Case. Beverly also has 16 great-grandchildren. “GG Bev” has had many fond memories with Preston, Aynslee, Quinton, and Kayson and will be missed by them dearly. Family will receive friends September 6, 2018 5:00 – 7:00 pm at Bell Mortuary in Glasgow. Funeral services will be 2:00 pm, Friday, September 7, 2018 at First Lutheran Church, in Glasgow, Montana with Reverend Todd Wright officiating. Burial will follow at Highland Cemetery in Glasgow, Montana. A luncheon will follow at Glasgow VFW, Post 3107.